← Will the takeover of Ralcorp Holdings Inc. by ConAgra Foods Inc. succeed? In this post, I will go briefly through the following factors that I believe are currently driving M&A activity in the technology sector. For each factor, I will provide at least an example whenever possible to back my opinions. Firstly, we all noticed that the smartphone market has grown rapidly in the recent years. 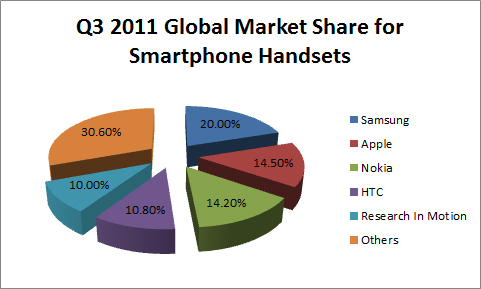 Back in 2006, I noticed that there were not many smartphones compared to other kinds of mobile phones as the consumers were mainly business users. When Apple launched the first iPhone, the product completely revolutionised the smartphone market forcing many players to change the way they design and manufacture these devices. Fast forward to today, we see that there are many models of smartphones, many of which are customisable to suit the preferences of the user. The smartphone revolution has resulted in the rapid growth of the social gaming industry and the appearance of many essential applications, such as medical and office, which enable users to carry out tasks more easily than before. Many developers have produced many applications that have gone viral and became an instant hit with the general consumer. Therefore, many technology firms have acquired developers of mobile phone applications so that they can produce new applications and social games that they hope will go viral and become successful. For example, Red Robot Labs has announced on December 9th that they have acquired Supermono Studios. They want to fulfil their vision of ‘creating the most engaging and dynamic location-based games in mobile ‘ (1). Secondly, Google is not competing effectively against Apple in terms of the smartphone handset market. They entered the market late compared to other competitors as they only launched their first phone in 2010, the Nexus which was manufactured by HTC. However, Google’s Android operating system was first used since they acquired it back in 2005 when HTC launched HTC Dream in 2008. Google has done very well in terms of the smartphone operating system market after initially lagging behind Apple’s iOS. 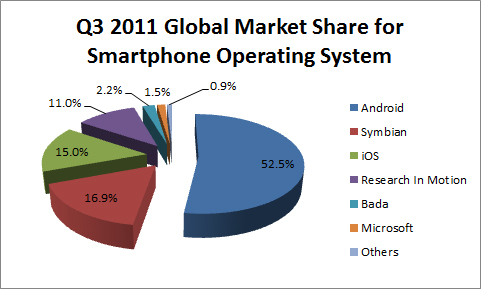 In 2010, the market share of Android overtook that of the iOS into second place. After the first quarter of this year, they eventually surpassed Symbian to become the leading smartphone operating system with 43.4% of the market share. Even though Apple’s smartphone handset market share for the third quarter if this year is only 14.5%, they have the highest operating profit share at 52% (2). Google has a lot of work to do in order to dominate this market. They decided to purchase Motorola Motability Holdings, a struggling handset maker, for $12.5 billion, $40 per share to acquire vast quantities of their patents (3). These are more likely to be used to produce a number of handsets to appeal a wide variety of consumers and to improve the Android operating system. However, I believe that Google is trying to protect itself from lawsuits from their competitors as they believe that former has infringed on their intellectual properties (4). Google will have to work very hard to overcome the huge challenges they face right now. Thirdly, there is a shift towards cloud computing from traditional computing as businesses and individuals want to access information from any device while on the move. Many companies, including major firms such as Oracle and HP, are buying cloud service providers in order to gain access to their expertise and develop their own services to their customers to enhance their profit margins. They also want to refine their existing services in order to make it even better. For example, Citrix bought Sharefile to refine their services in order to fulfil their vision of providing individuals access to their data anywhere from any device (5). GlobalSCAPE has bought Tappln for $9m to combine the former’s expertise in providing secure cloud storage and data exchange service with the latter’s service which lets users access their data stored on their storage devices anywhere via internet or smartphone (6) (7). Oracle acquired Rightnow for $1.5bn to expand their cloud computing services for their enterprise customers (8). The latter three are conducting due diligence, that is, checking thoroughly what exactly are they buying. The former are planning to make a bid for the company for about $25bn. This entry was posted in M&A Analysis, Mergers and Acquisitions and tagged cloud computing, Google, M&A, mergers and acquisitions, mobile phones, smartphone, technology, technology M&A, technology mergers and acquisitions, Yahoo. Bookmark the permalink. 1 Response to Which factors are currently driving technology M&A?